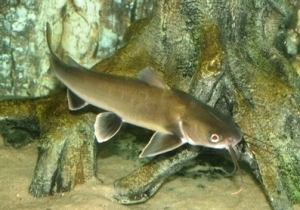 Young Shark cat at around 6" (15cm). Size: Usually around 12-14" (30-35cm), but can reach 24" (61cm). Origin: North, Central and South American rivers and estuaries. Tank setup: Large brackish tank with plenty of open swimming space. Compatibility: Predatory, likely to eat any fish small enough to fit in their mouths. Slightly territorial towards their own kind, peaceful with other fishes. Keep with large brackish fish, such as adult Scats or Monos. Water chemistry: Neutral to alkaline, slightly brackish to marine. Feeding: Carnivore: live and frozen meaty foods, dry foods such as sinking catfish pellets can be used to balance the diet. Sexing: Males are more slender than females. Breeding: Not usually spawned in the aquarium, changes in salinity required. A mouthbrooder. Comments: These fish are best kept in a small group. They are often seen for sale at 2-3" (5-7.5cm), but the potential size should be taken into account before buying. These fish are often sold from, and kept in, freshwater tanks when younger, but they should be converted to brackish water for their long term health. Low level brackish conditions (around s.g. 1.005) will suffice for young fish, but older specimens are best kept in stronger brackish conditions at around s.g. 1.015 or above.